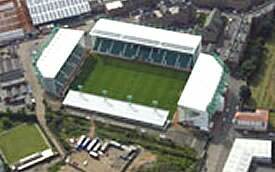 Easter Road is a shining example of what a medium sized SPL club can achieve, with good financial management. The ground has been greatly improved over recent years, with the third new stand being opened at the start of the 2001/2002 season. This new stand runs the length of the pitch, is two tiered, offers excellent views and facilities, and has raised the capacity to 17,500. The two end stands are also relatively new, and identical. They also offer excellent view and facilities, with no impaired views. The remaining East stand is a through-back to the old days. This stand used to be terracing, and was converted to seating in the eighties. Obviously, as this is an older stand, there are the usual pillars, which if you are unfortunate, can impair your view. Away fans are normally located within the new South Stand, at one end of the pitch. Refreshments can be found in modern serveries in the North, South and West stands while traditional 'pie huts' can be found at the back of the East terracing. The food is of good standard with 2 types of pie on offer, the traditional scotch pie or a better quality steak and gravy pie. Pizza, sausage rolls and various other hot foods are served. All the usual crisps, sweets and hot / cold beverages are available. There is a Restaurant within the North stand. Fans can dine in this during match days (at a cost!) as they watch the match. Easter Road is not too far from Edinburgh City Centre, so the usual McDonalds, Burger King, KFC are available and only a 10 minute drive from the ground. Take A90 Queensferry Road to A902 and continue for 2? miles. Turn right into Great Junction Street and follow into Duke Street then Lochend Road. Turn sharp right into Hawkhill Avenue at Lochend Park and follow road into Albion Place for Ground. There isn't a designated car park, but spaces can be found just off Leith Walk (Iona street, Albert Street etc . .) and also parking can be found at Lochend (to the East of the ground). If you are a registered user then you can login, and create your own personal review of Hibernian Football Club - Easter Road Stadium. These reviews can be private or public.